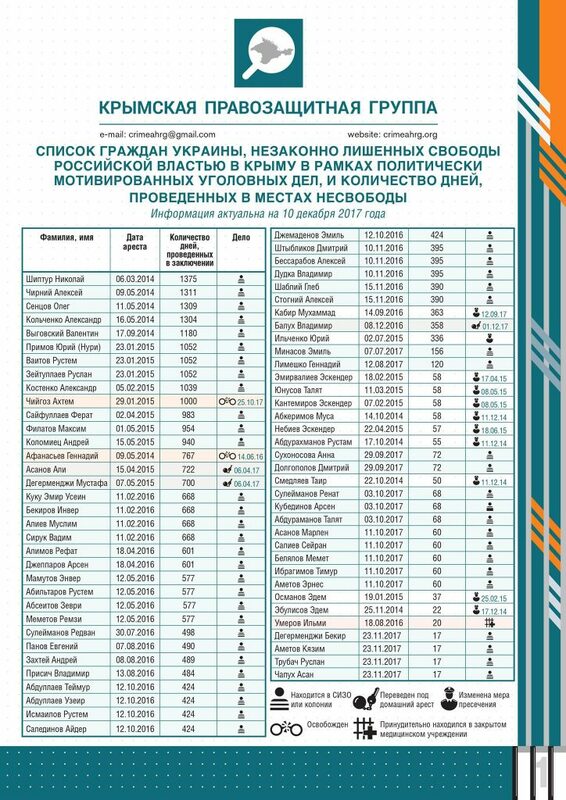 To mark International Human Rights Day, the Crimean Human Rights Defense Group has released an infographic on the at least 70 people in the Russian-occupied Ukrainian peninsula who have been jailed on the basis of politically motivated criminal cases and thus qualify as political prisoners. The number of political prisoners under the Russian occupation has grown from five in 2014 to 20 in 2015 to 41 in 2015 and in the last year has jumped to 55, an increase of 1100 percent since the Russian Anschluss. At the present time, there are 52 political prisoners in prisons, detention centers or under house arrest. Two weeks ago, the Ukrainian government has appealed to the Council of Europe to intervene on their behalf.